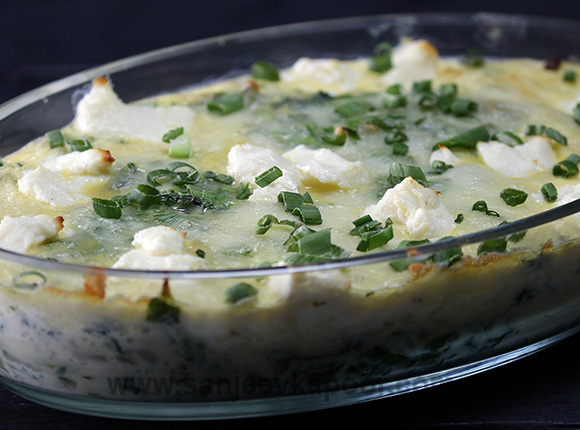 A French delicacy – egg-milk mixture poured over spinach-dill mixture, topped with mozzarella and feta cheese and baked. Heat oil in a non-stick pan. Add onions and spring onion bulbs, mix and sauté for 1 minute. Add spinach and sauté for 1 minute. Remove from heat and set aside. Break eggs into a bowl, add salt and cornflour and whisk well. Add milk and whisk to a smooth mixture. Add salt, crushed peppercorns and dill leaves to the cooked spinach mixture and mix well. Spread the spinach mixture in a baking dish and pour the egg mixture over it.Top with spring onion greens, mozzarella cheese and feta cheese. Place the dish in the preheated oven and bake for 10-12 minutes.